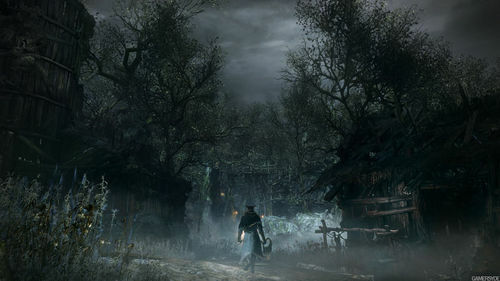 A forest on the outskirts of Yharnam. Home to a village of those chased from the city and the nesting grounds of a great, venomous snake. Entering the forest is forbidden by the Church. In this area, you will encounter a Suspicious Beggar, who waits atop the windmill amongst a pile of corpses. You will also find Valtr, the leader of The League and is located in a hut. The Afflicted Beggar is located at the top of the second windmill in the Forbidden Woods. He is found stooped over the disfigured corpses of a man, woman and child. If attacked, he will transform into the Abhorrent Beast. Finally, you will face off against Shadow of Yharnam. Whistle of the Madaras twins, denizens of the Forbidden Woods. developed a silent, inhuman kinship. Woods, likely belonging to the older of the two. The twins grew up in silent kinship with a poisonous snake. Eventually they learned human ways, and became hunters. the younger brother is said to have murdered the older. Mask of Dores, graveguard of the Forbidden Woods. His pale countenance mimics the labyrinth Watchers. Willem kept two loyal servants back at Byrgenwerth. Both remained loyal, even in madness.